In a mixer bowl, add the butter, the sugar and the eggs and start beating them until the mixture is homogeneous and somewhat fluffy. Add the vanilla, ouzo and lye and keep beating the mixture for a while. Then put the mixture in a deep bowl, and start working the batter with your hands while adding gradually the flour. When it starts getting stiff, add the almond. Cover the batter with a damp towel and let it rest for a while. At the same time, butter a baking tray and preheat the oven in air at 180˚C. Knead small kourabiedes (size of a walnut) until you have no more batter, put them in the tray and bake them for about 20 minutes. When ready, remove from the oven and, while still hot, sprinkle with confectioner’s sugar. 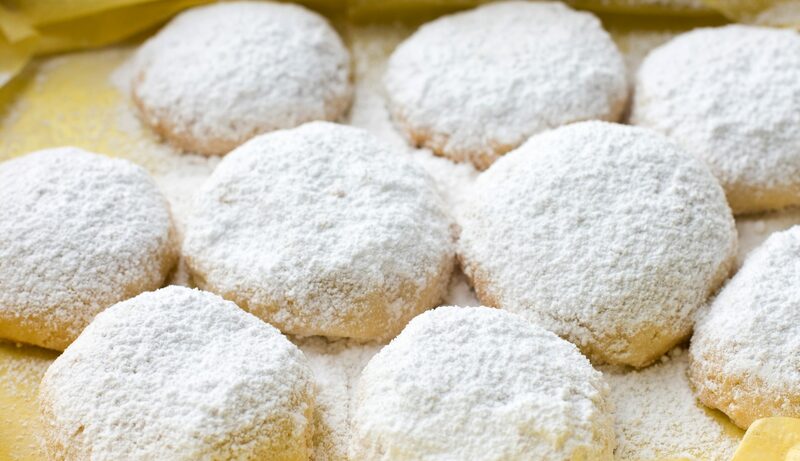 Finally, put them in a platter and sprinkle them with lots of confectioner’s sugar once again.